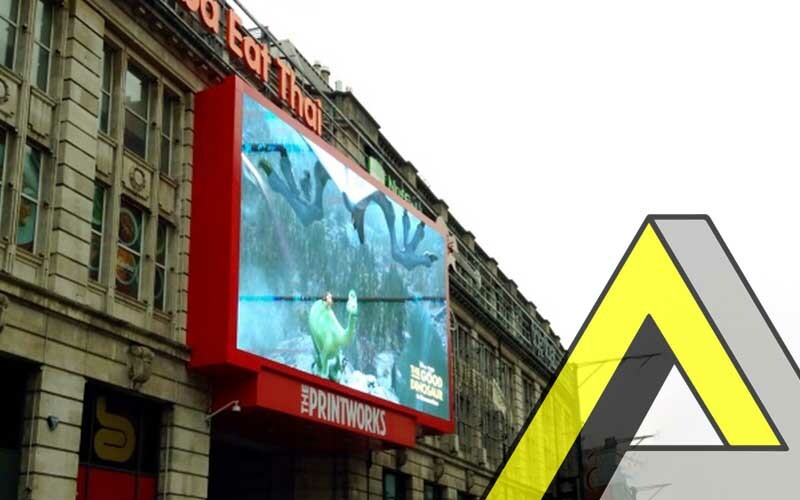 A full motion digital screen has just been installed on the exterior wall of a well known entertainment venue – The Printworks in Manchester city centre. An ultra-lightweight oblik structure was required because the building is Grade 2 listed. The screen resolution is 1344 x 768, made up of 168 screens sections. Boldman were required to design and manufacture a supporting LED screen structure for a new video screen at the Printworks Manchester. The structure had to be lightweight as it had to be fastened to the existing steelwork found within the Printworks grade 2 listed building. Boldman in conjunction with Alan White Design, Glasgow were the design partners on this project. The screen is unique as it used the Oblik framework for the screen which has not been done before and is the largest of its kind. The oblik framework is constructed from 156 identical fabricated aluminium profiles measuring 13.9m x 7.8m x 0.6m deep and weighs approximately 5.5 tonnes. Fastened onto this frame are 44 lengths of aluminium extrusion with brackets to mount the 168 screens – each measuring 960mm x 640mm. The total weight of the screen is approximately 10 tonnes. Aluminium extrusion was the ideal material to use providing a modular lightweight load bearing structure to mount the 168 screens to. This type of construction is exceedingly flat and accurate compared with traditional steel supporting structures. The picture quality is of a very high quality resolution due to the structure being so flat. The screen is designed to withstand weather conditions within this area of Manchester; it is extremely durable as it is constructed from 156 identical fabricated aluminium sections. The structure itself is capable of supporting over 100 tonnes which would be 10 times more than is applied in this application.